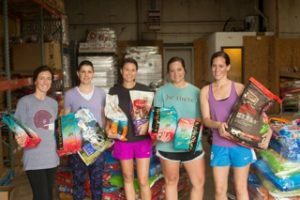 Junior League members volunteering at The Pet Food Pantry of Oklahoma City, Inc. help provide food to cats and dogs belonging to the homeless, elderly, and veterans in the metro Oklahoma City area. Often times our community’s seniors and homeless have to decide to feed themselves or feed their pets, which is a daunting choice as their pets may be their only companion. As a result, these individuals will choose to go hungry so they can feed and keep their beloved pets, which is a decision no member of our community should have to make. With the Pet Food Pantry, animal-loving JLOC volunteers assist in providing food for the pets while helping keep food on the table for their owners. Through coordinated pet food drives, supply drives, and packaging sessions, JLOC volunteers collect, account for, and repackage the pet food for distribution at different community events. Volunteers also create pet disaster kits, for use in natural and man-made disasters as needed.